- Direct3D is used by default and seems to be the best quality/performance output (Desktop computers with low CPU power and 'memory shared GPU' should use this mode). - DirectX is a nice output but usually used for few windows. HamMultiPlayer has bug display with it. - OpenGL outputs a good quality picture but is slower than Direct3D (your video card's drivers have to be compatible). - MatrixView : a Matrix movie's like display. - OpenGL Hardware : May work faster than OpenGL. Just try ! - Fast : Standard display without deblocking. Fastest (default). - Medium : Horizontal and vertical deblocking (picture enhance). Slower than Fast. - Slow : Best display quality, process accurate Horizontal and Vertical deblocking + Deringing + Sharpness. This is the slowest, it uses a lot of GPU power. Defines how many lines of previews and how many previews you want per line. By default, HamMultiPlayer starts with 1 line and compute movie's number based on screen resolution. Example : 2560x1440 screen permit 55 previews : 5 lines of 11 previews and 1920x1080 display => 3 lines of 8 : 24. You can define default starting position when video are loaded. This is usefull to have a quick look at movies after loading. - 5% is a good choice but makes mplayer seeking inside files (it can be slower with slow hard drives). There are several thumbnails displays. This setting define how many thumbnails will be displayed by line. Number of lines is always automatic. When changing page, you can define what settings are kept or not. - Nothing : All settings are kept (Carfull, using InterFrame on previews and changing page will load new files using InterFrame. If new files are FHD or UHD, it can slow down your computer). - Image : Only reset Image settings. - InterFrame : Only reset InterFrame settings (Good choice). 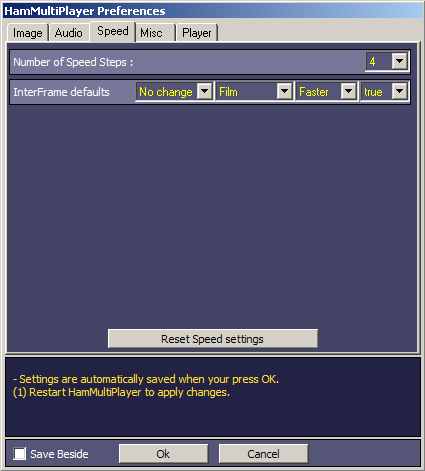 - Speed : Only reset Speed settings (Do not use this option if your goal is to preview any movies slowly). - All : Reset all settings (default) -> You should use this option when you don't know what will be next files. Defines what Decoder will be used on your system (must be installed). - I recommend to leave it on NO and selecting in previews options when you need it ! - External decoder Output : mplayer and external decoders work fine with OpenGL Hardware output driver. - 2.0 Mono : Outputs a single audio signal on 2 speakers (both outputs are the same). - 2.0 Stereo : Two channels (default). - 4.0 Stereo : Two channels played on four speakers (Front Left = Rear Left) + (Front Right = Rear Right). 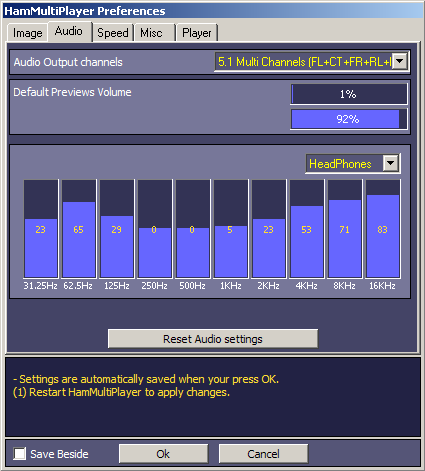 - 5.1 Stereo : Two channels played on 5.1 speakers. - 5.1 MultiChannels : Most used in games or cinema display. - 7.1 MultiChannels : Same as 5.1 with two more outputs. - If playing only mp3 sound, you should use 2.0 Stereo or 5.1 stereo (mp3 is always stereo). - If playing AC3, DTS, Cinema or 5.1 Games sould use 5.1 or 7.1 multiChannels. - First one sets previews volume (when loading previews). - Second one sets "BigDisplayed" previews. Note : Changing volume inside each preview does not change this, but changing this volume will change current preview if "BigDisplayed". Defines "default equalizer settings" used by previews. Number of speed steps : Defines how many steps used. - selecting "Change medias speeds" will swap between these different values. Lets you define what defaults will be used when using InterFrame inside each preview. Assuming your GPU does not use hardware acceleration, you should set FALSE. If it does (AMD or NVidia cards), select TRUE -> InterFrame will be faster. HamMultiPlayer Mode : Full / Fast. - Fast : In this mode, HamMultiPlayer starts, scans current directory then displays medias without waiting for user actions. Note : You can change User mode via Tray Icon in Windows Tools bar at any time. Converter Path : Converter path that HamMultiPlayer will use when exporting. Virtualdub Path : The Virtualdub path (if installed) when exporting. Player Path : The default player you want to use (if no player is defined, Windows system player will be used). HamCPU : Few years ago, i developped a CPU display to control what computer is doing. 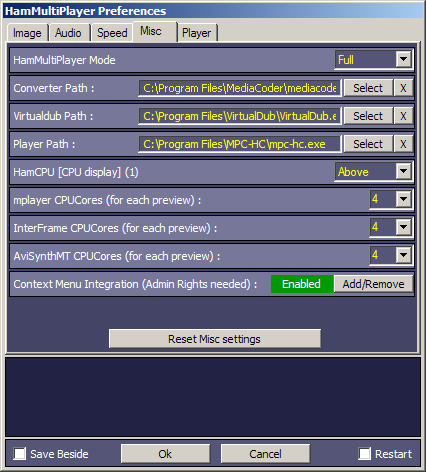 This small utility is included inside HamMultiPlayer and can be placed Above or Under main interface. Read more about HamCPU. mplayer CPUCores : Sets how many cores will be used by each preview when playing. InterFrame CPUCores : Same thing for InterFrame. (If installed). AviSynth CPUCores : Same thing for AviSynth. (If Installed). Context Menu Integration : Will add HamMultiPlayer in Windows Explorer menu. If enabled, "right clicking" a directory in explorer and selecting HamMultiPlayer will start loading that directory. Note : HamMultiPlayer must be started with "Administrator rights" for this control becomes enabled. "Green Enabled" => integration, "Red Disabled" => No integration. 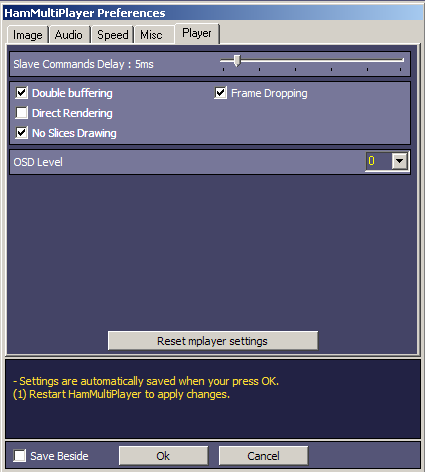 Slave Commands Delay : Sets time HamMultiPlayer waits between sending commands to mplayer. (Default is 5ms). Double buffering : Ask mplayer to preload image before displaying it. Checked = Better display, Unchecked = Faster. Direct Rendering : Turns on direct rendering (not supported by all codecs and video outputs). No Slices Drawing : Disable drawing video by 16-pixel height slices/bands, instead draws the whole frame in a single run. May be faster or slower, depending on video card and available cache. Frame Dropping : Authorize mplayer to ignore frames when decoding (can be faster). 0 = Subtitles only (default). 1 = Volume + seek. 2 = Volume + seek + timer + percentage. 3 = Volume + seek + timer + percentage + total time. SaveBeside : Saves preferences beside HamMultiPlayer (exporting is now easier). When starting, HamMultiPlayer will look for "HamMultiPlayer.ini", if it does not find it, it will look for TempFiles/HMP.ini, if not find, it will create it !